“Bob Dylan” Copyright (c) 1995 Grant Jacobs. Used by permission. From Haight-Ashbury in the Sixties! CD-ROM. Bob Dylan – The Official Bob Dylan site. ISIS magazine – the magazine for Bob Dylan enthusiasts. Expecting Rain — Excellent news source (see news feed, upper left). Folk Song Database — a collection of traditional folk songs. Roots of Bob — Excellent articles on the roots of Bob Dylan’s music. On The Bootleg Series, Vol. 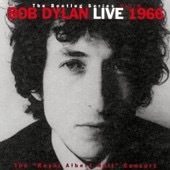 4: Bob Dylan Live 1966, you hear one of the finest acoustic set he ever performed up to that time, and then he comes out for the second set with the Band (then called Levon Helm and the Hawks, but Levon was absent for this tour, replaced by Mickey Jones). While most of the audience accepted Dylan’s new music, there were also lots of jeers and heckling. Bob Dylan’s switch to electric rock at the Newport Folk Festival is often cited as a turning point, but the fact is that the sound system was not set up properly, and Dylan’s voice could not be heard above the roar of the backup band (the Paul Butterfield Blues Band with Mike Bloomfield and Elvin Bishop). At first, the shouting from the audience was for more amplification of Dylan’s voice, then for turning down the electric guitars. 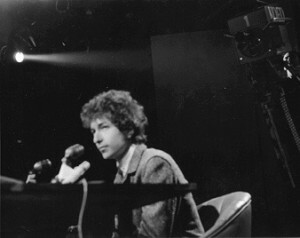 There was, however, a minority of audience members and performers who were upset at Dylan’s “switch” from folk to rock. News of Dylan’s hard time at Newport (preserved in the song “Rainy Day Women #12 and 35” — “Everybody must get stoned!”) was global, and insults and angry shouts greeted him at subsequent shows for more than a year. Some say it was mostly folk purists who’d read about the Newport incident and joined the hate bandwagon. By the time Live 1966 was recorded the audience was clearly divided between folkies and rockers. The polarity of their response to Dylan’s music actually increases the passion and intensity of the performances. Bob Dylan’s recruitment of the Hawks, with Robbie Robertson, Levon Helm, Rick Danko, Richard Manuel, and Garth Hudson, occurred during this period. Later known as The Band, they were playing roadhouses in Toronto, in the South, and when the call came in from Dylan, on the New Jersey coast. Robbie went to New York with Levon to check out Dylan, and the entire band joined Dylan for a set of shows in the U.S. After much booing and heckling, Levon decided not to go on the European leg of the tour, and Dylan recruited Mickey Jones. The lineup for the Live 1966 concert: Robbie Robertson, guitar; Rick Danko, bass; Garth Hudson, organ; Richard Manuel, piano; and Mickey Jones, drums. The first song of the electric set, “Tell Me, Momma” (a Dylan original that has no studio version), sets the pace dramatically. “Baby, Let Me Follow You Down” is incandescent. “One Too Many Mornings” has the earliest recorded Band sound that would later be so prominent in Dylan and the Band’s Basement Tapes. “Ballad Of A Thin Man” offers some of the most inventive organ-playing by Garth Hudson, with cutting edge singing and altered lyrics by Dylan. “Like A Rolling Stone” is simply magnificent. The CD includes other great songs and an excellent acoustic set. 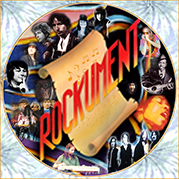 The first CD is Dylan’s solo acoustic set and features “She Belongs To Me,” “Fourth Time Around,” “Visions Of Johanna,” “It’s All Over Now, Baby Blue,” “Desolation Row,” “Just Like A Woman,” and “Mr. Tambourine Man.” The second CD features Dylan and the Hawks on “Tell Me, Momma”, “I Don’t Believe You (She Acts Like We Never Have Met),” “Baby, Let Me Follow You Down,” “Just Like Tom Thumb’s Blues,” “Leopard-Skin Pill-Box Hat,” “One Too Many Mornings,” “Ballad Of A Thin Man,” and “Like A Rolling Stone.” Live 1966 comes in a deluxe slipcase containing a two-CD brilliant box and a stand-alone 56-page booklet containing many rare and previously unseen photos from the era and an essay by Tony Glover, whose friendship with Dylan extends back to 1960 on the University of Minnesota’s Dinkytown folk scene. Live 1966 was mastered by Greg Calbi. The electric portion of the concert was mixed by Michael M. Brauer. Bob Dylan’s rise to stardom as a folk singer-songwriter is chronicled in various books and documentaries, but none as good as D. A. Pennebaker’s Don’t Look Back.